Saturday November 13th 1920 Hattie was home all day preparing a turkey supper. I helped some about the work. Cora went to the game with Emily Bremner. It was Home-Coming and a big day the store. Ron did not get home to supper. The folks from the other house were here. William is some better. We rode over late afternoon to see Will Bremners private car on tracks. Sunday November 14th 1920 It was snowing this morning. Ott called up to tell us that Fannie was sick. Hattie went down there Rob & Cora to town awhile. I read some. I wrote to May in afternoon and read a book in evening. All at home. Monday November 15th 1920 I did some sewing in forenoon. Cora to town in AM to work at store. Hattie over in afternoon. I went down to sit with Fannie. We were all at home in evening. Legrand came up to say good-bye. He goes to Detroit tonight. 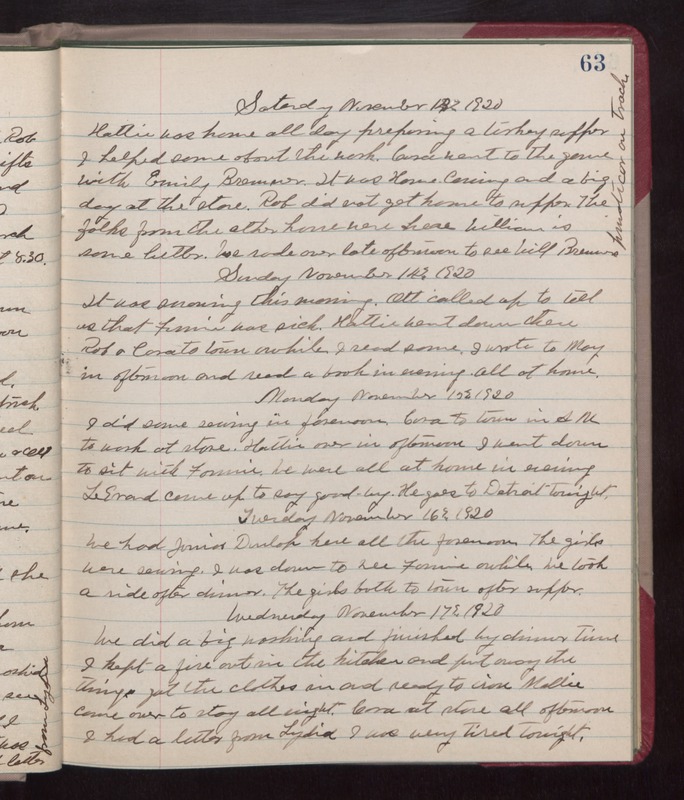 Tuesday November 16th 1920 We had Junior Dunlap here all the forenoon. The girls were sewing. I was down to see Fannie awhile. We took a ride after dinner. The girls both to town after supper. Wednesday November 17th 1920 We did a big washing and finished by dinner time. I kept a fire out in the kitchen and put away the things, got the clothes in and ready to iron. Mollie came over to stay all night. Cora at store all afternoon. I had a letter from Lydia. I was very tired tonight.